Moisture problems don’t always occur as the result of burst pipes or rising waters due to heavy storms. In some cases, the water comes in from the outside on a consistent basis due to poor site maintenance. If you suspect that your home is experiencing high moisture levels and the accompanying problems that are usually attached to damp conditions, contact water damage experts for an evaluation of your property, the severity of the problem, and possible resolutions. Poor drainage around the foundation of a property can lead to water intrusion through the floor and lower portion of the walls. 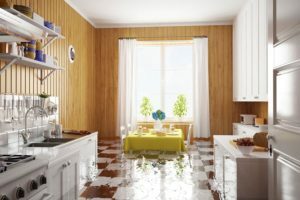 This problem might not be noticeable in its earliest stages, but as any water damage expert will tell you, it is likely to get worse. Improving drainage capability is critical to eliminating the problem, so steps should be taken to slope the surrounding terrain away from the property. A landscaper can assist with this task. Specialized drainage pipes that can carry ground water away from the building should also be considered. Moisture problems in a building often arise from poor ventilation caused by air-tight construction that fails to allow air circulation of any kind within the structure. As a result, condensation builds up and water damage can occur. Rooms prone to this type of problem include bathrooms, kitchens, and basements. While you can address the situation with exhaust fans and dehumidifiers, water damage experts can provide service and tips to assist in remedying the problem in an effective manner. Although water damage caused by permeating dampness isn’t common, it does occur. The problem is usually related to the absence of a solid wall moisture barrier. Basically, moisture is getting in through cracks in the building’s exterior. Water damage experts have the training needed to identify the problem, assess why it is occurring, and offer suggestions on prevention. The primary goal is to prevent water from getting into the home from its exterior, so maintenance tasks like caulking, weather stripping, and cleaning gutters, windowsills, and drainage pipes should take place at least twice a year.